The Samtengang Trek is one of the easier lower altitude treks in Bhutan. It explores some of the beautiful forests, many remote historical and religious sites and isolated villages in and above the Punakha & Wangdi Valley. Weather permitting, it also offers stunning views of mountainous peaks including Jumolhari (7315m), Kang Bum Peak located above Gaza (6300m) and Tiger Mountain (Gangcheta 6840m) north of Laya. Some of the climbs may be steep and challenging. This trek is especially recommended in winter as there is the possibility of leeches on the trail during the remainder of the year. The Samtengang Trek is a moderate 4-day hike exploring some of the beautiful forests, many remote historical and religious sites and isolated villages in and above the Punakha & Wangdue Valley. This tour also visits some of the many highlights of the Paro and Thimphu Valleys. Enjoy incredible views of mountain peaks including Jumolhari. Pass through pine, fern, oak and rhododendron forests and plantation fields. Explore seldom visited, remote communities and sacred buddhist sites. Experience Bhutan’s unique culture up-close with farmhouse visits and village excursions. The flight to Paro is one of the most spectacular mountain flights in the world, with a constantly changing panorama of some of the highest mountains on earth. Our representative will meet you at Paro airport. After lunch enjoy afternoon sightseeing around Paro, including a visit to the National Museum, Ta Dzong. This museum houses many religious relics, works of art and handicrafts offering a great orientation into Bhutan’s historical, cultural, and religious past. Next, visit the Rimpong Dzong to see the painting of the great saint Milarepa, considered as the master of meditation by the Bhutanese and believed to have attained enlightenment in a lifetime. Dzong’s are large monasteries and district administrative centres, which were once strategic forts. Afterwards, transfer for Thimphu for overnight (1.5 hours). Enjoy a full day of sightseeing beginning with a visit to the National Memorial Chorten depicting the Buddhist faith in the form of paintings and statues. This temple was first initiated by the Third King as a protection from the negative elements of modernization. The Royal Queen Mother completed it as a memorial stupa for the third King who passed away in the year 1972. Other highlights include the 12th Century Changangkha Temple, Drubthob monastery housing the Zilukha nunnery, the School for Arts and Crafts where the students are taught to master the 13 types of Bhutanese art, the National Library housing a collection of Bhutanese scriptures dating back to the 8th century, and a fascinating replica of a medieval farmhouse at the Folk Heritage Museum. If there is time, you may also visit the nursing pen for the Takin, the national animal of Bhutan and Tashichhodzong. ‘the fortress of the glorious religion’. Initially built in 1641 by Shabdrung Ngawang Namgyal, it was rebuilt in the 1960s during the reign of Bhutan’s third king in the traditional style, without plans or nails. Tashichhodzong houses government ministries, His Majesty’s secretariat, and the central monk body. Overnight at your hotel in Thimphu. Punakha was the ancient capital of Bhutan. On arrival, visit Punakha Dzong, built in 1637 by the Shabdrung, the ‘Unifier of Bhutan’ as predicted by the great Guru Rimpoche (Padmasambhava). It is situated at the confluence of the Mo Chu and Pho Chu (Mother and Father Rivers) and is the winter headquarters of the Je Khenpo and hundreds of monks who move en masse from Thimphu to this warmer location. The three story main temple of the Punakha Dzong is a breathtaking example of traditional architecture with four intricately embossed entrance pillars crafted from cypress and decorated in gold and silver. After lunch, enjoy a walk to Chimi Lhakhang, temple of the Drukpa Kuenly who is also known as the Divine Madman. He inherited the Divine Madman title since he revolted against the orthodox Buddhism in his time. He taught the people that religion is an inner feeling and it’s not necessary that one should be an ordained monk. He is also considered a symbol of fertility and most childless couples go to his temple for blessing. Overnight at your hotel in Punakha. The trek starts upstream from the Punakha Dzong, over the longest suspension bridge in Bhutan (180m) across the Pho Chhu. Climb gently on the left side of the Po Chhu through terraced field of mustard and winter wheat. The Punakha valley is low enough to enable two harvests, so there is plenty of activity in the field in the winter months. The valley also produces fruits such as bananas and oranges. After about a 2.5hr hike uphill through pine forest, fern, oak and some rhododendron, there is a nice clearing for lunch with a big prayer flag and a beautiful view over the valley. In the far distance the huge chorten, Khamsum Yuelley Namgyal, can be seen. Looking to the west the road to Dochu La can be partly traced, and if lucky some snowy peaks maybe visible: Jumolhari, kang Bum and Tiger mountain. A chorten and some prayer flags on the skyline at 2200m indicate the end of today’s climb. From the chorten you can see towards Wangdi and Limbukha where our campsite (2220m) is located just behind the village on a beautiful green area (1.5hr). Limbukha has several large old houses. Some people say that this place, at the upper end of a watershed, used to be a lake. The inhabitants perform a special annual ceremony in connection with the lake, when they begin to irrigate the fields. In former times a king lived here. Leaving camp climbs steeply (150m) up to a small ridge (2370m) through a cold dense forest, from which today’s climb is visible. Cross this ridge, and descend steeply into a small side valley where a small stream (2235m) is crossed. Surrounded by beautiful birdsong and oak and rhododendrons forest, follow an unclear trail covered by slippery leaves. After about 2hrs of climbing reach a small pass, Dochen La (82645m) littered with prayer flags and possibly a good view towards Dochu La, Jumolhari, Kang Bum, Tiger Mountain, as well as Talo Lhakhang and Nobgang Lhakhang down in the valley. After the pass a steep steady descent follows along a forest trail. The forest opens up after reaching Dagegon with a beautiful big old farmhouse. In the distance a ridge with Samtengang village and Chhuni Gompa can be seen. Walk alongside Dargyel Gompa, an old monastery of Drukpa Kinley, the` Divine Mad Madman’, whose teaching methods often shocked monks and lay people. On the hillside above the monastery are several small meditations cells. At 1850m Chungsakha (Chhungsekha) is reached. The village has one lhakhang with a simple but atmospheric chapel on the first floor. The monastery has a festival every three years with masked dances and singing. The campsite is in front of the Lhakhang. Descend to the road in 45min and find a suspension bridge crossing the Bae Chhu 1500m. The trail from here is clear, and moderately steep passing through several villages. The trail goes through small deeply eroded gorges, which will be very slippery in the rain. In December, the daphne flower is already starting to flower. The climb is finished for the day when you pass Samtengang High School (established 1952) on your right. Walk through a narrow gorge to the other side at 2000m and look down towards a holy lake, Lutshokha (Tsho Shokha). Afterwards continue on to the campsite, located on the other side of the lake and other 20min beyond it. It is a beautiful flat campsite (2050m) in the forest below the village of Samtengang. After lunch there will be plenty of time either to visit Samtengang or stay in camp and enjoy the fresh wind blowing through the pines. There is a wonderful trail climbing up to Samtengang Village. The local Lhakhang is Gonjo Lhakhang, and there is another one 2hrs above the village. Samtengang is mentioned again and again in old literature regarding travelling/exploring/plant hunting in Bhutan. It was the old stopping place on the first day out from Wangdi for people travelling east-west (and vice versa). The booklet ‘The Ballad of Pemi Tshewang Tashi: A Wind Borne Feather’ by Karma Ura will tell you more about the history of the area. Starting near camp, the trail today is steep and challenging. It passes through endless agricultural fields, heading into the valley of the Dang Chhu. The road will be reached next to the bridge at Tika Zam (5100ft/1555m). Overnight at a hotel in Wangdue. This morning visit Wangduephodrang Dzong. Built in 1639 the strategically located Dzong is perched on a spur at the confluence of two rivers. In the 17th century Wangduephodrang played a critical role in unifying the western, central and southern regions of the country. Drive back to Thimphu where you will enjoy lunch and have an opportunity to visit handicraft and souvenir stores. Afterwards proceed to Paro. On arrival in Paro, check into the hotel. After breakfast hike to Taktsang Monastery. The trail is broad and the walk of approximately 1.5 to 2 hours uphill takes you high above the Paro valley. The view of Taktsang Monastery built on a sheer cliff face 900 metres above the valley floor is a spectacular sight. The Monastery is also an important pilgrim site for the Buddhists. The great Guru Rimpoche is said to have flown here on the back of a tigress when he brought the teachings of the Buddhist Dharma to Bhutan in the 8th Century. Nearby there is a teahouse where you can stop for refreshments before returning to Paro for lunch. In the afternoon drive to the ruins of the 17th Century Drukgyel Dzong, an historic monument built by the Shabdrung to commemorate his victory against invading Tibetans in 1644. In fine weather the towering peak of the sacred Mount Jomolhari (7314m) appears as a stunning backdrop. On the return drive to Paro, visit 7th Century Kyichu Lhakhang, one of the 108 temples constructed by the Tibetan king Songtsen Gampo. Kyichu is built in a manner similar to the Jokhang in Lhasa. Inside there is a great golden image of Buddha Shakyamuni. Overnight at your hotel in Paro. Sustainable Development Fees & Visa fees. 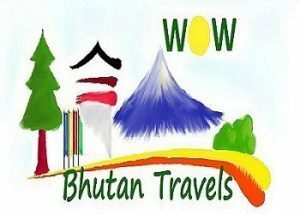 Whether you know exactly where you want to go or need some inspiration, Wow Bhutan Travels is here to guide you, and to create a journey that will surpass your expectations.